Why would I need self storage in Magnolia, TX? There are a variety of reasons why you might need self-storage in Magnolia, TX. How much is a storage unit in Magnolia, TX? The cheapest storage unit in Magnolia, TX is $12.00 per month. What size storage units do you have available in Magnolia, TX? In Magnolia, TX we have sizes that range from 5'x5' to 15'x35' to suit your storage needs. How much is it for a 5'x5' storage unit in Magnolia, TX? The cheapest 5'x5' storage unit in Magnolia, TX is $13.00 per month. Magnolia is a very small city in eastern Texas, included in the Houston metropolitan area. An extremely family-oriented city, it is home to a large number of young families that have been drawn to its cozy setting and safe community. Just 45 miles northwest of the major city of Houston, Magnolia offers a quiet, scenic retreat within easy reach of big-city amenities. The community of Magnolia has attracted residents with its small-town charm since the mid-19th century. Originally known as Mink, in the early 20th century Magnolia became a thriving area known for its sawmills, shipping industry and thriving commercial center. 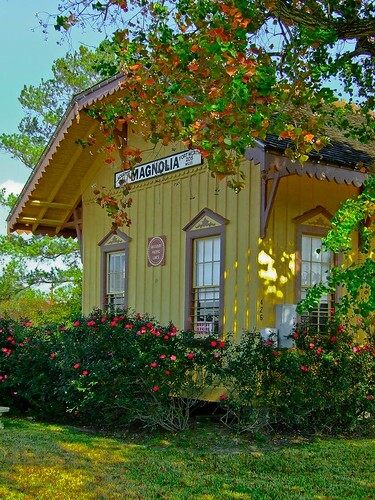 Magnolia was incorporated as an independent town in 1968, and it still maintains ties to its past, thanks to the Magnolia Historical Society and the city's annual Depot Day. Though Magnolia is a very small town, it still offers plenty of amenities for residents to enjoy. The numerous local events, such as community 5K runs and weekend food and wine festivals have contributed to the tight-knit sense of community and make it easy to get to know your new neighbors. Unity Park is one of Magnolia's community parks, serving as a popular site for family gatherings, birthday parties and more. Another gathering spot is The Stroll, a half-mile pedestrian walkway shaded by large trees. Many of the community events take place there and it also provides easy access to some of the area's local shops and restaurants. If you're planning to look for a job in Magnolia, you have many options in the small city's local businesses. As the city grows and develops, more job opportunities arise. You can also commute to one of the neighboring cities for work. In Magnolia and the greater Houston metro area, the largest industries include trade and transportation, professional and business services, education, health services and government. These industries can be a good place to start your job search. Students living in Magnolia enroll at Magnolia Independent School District. In addition to its traditional elementary, middle and high schools, the district also provides secondary students with an alternative campus option, ALPHA Academy. Utilities: The city utilities department maintains water and sewer services. Natural gas providers in the area include Hughes Natural Gas and Universal Gas Co. For electricity services, you'll need to choose your own provider from several private companies that serve the area. Garbage and Recycling: Trash is collected twice weekly. Included in the regular collection services is bulky item pickup, though you are limited to the amount of bulky items you can put out per day. Transportation: Because Magnolia is such a small town, public transportation services are limited. However, the city is well-connected via a number of highways, so using a personal vehicle to get around is very convenient. The most reasonably priced homes in Magnolia can generally be found on the northwestern side of the city. Pricier homes tend to be on the city's southern side, especially in the Yorkshire Forest neighborhood. There are also options for renting, many of which are fairly new and include modern design and numerous amenities. Our lowest priced units in Magnolia, TX average $20.88 per month. 346 people have reserved units in Magnolia, TX in the past 30 days. There are 8 locations within Magnolia, TX's city limits. There are 8 locations in Magnolia, TX that offer AC and Heating features.